A luxury villa rental in St. Tropez is not just for summer fun, but also for fall adventures! When most people think of St. Tropez, they think of summer; maybe visiting for a couple of weeks in July or for a month at the beach in August, which is Europe’s traditional time for vacations. While the Cote d’Azur is undoubtedly beautiful in the high summer months, it can also be quite hot, congested, and expensive. An alternative to jostling among the summer crowds for a beach chair or restaurant reservation is to book a luxury villa rental and head to St. Tropez as the busy summer season draws to a close. The weather at this time is still mild and the atmosphere is decidedly more casual, two of the reasons The Guardian just named St. Tropez one of their Top 10 choices for autumn sunshine vacations, together with such gorgeous places as Sardinia and Dahab. So why choose fall over summer? For a variety of reasons, the first of which is the weather. Instead of sweltering heat you will be able to enjoy much more moderate temperatures of around 25C while sunning yourself by the pool at your luxury villa rental or taking a stroll in St. Tropez’s town center. Browse through the luxury shops or stop for brunch without being inundated by the summer crowds of jet-set vacationers and gawkers. As The Guardian notes, St. Tropez, the “summer playground of the glitterati, the flashiest seaside resort in the Côte d’Azur takes on a whole new identity come autumn…Most of the crowds are long gone, leaving behind a more laid-back town. Beaches which are usually packed are blissfully quiet, as are its posh boutiques.” So if you really want to enjoy St. Tropez without the bother, then visiting in the autumn could definitely be the right choice for you. And don’t think that the end of summer means the end of fun and activity in St. Tropez, either — nothing could be farther from the truth. 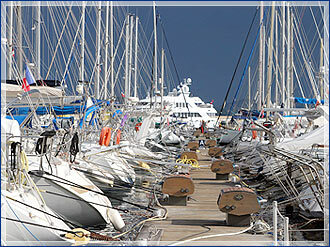 In fact, one of the biggest events of the year here, The Voiles de St. Tropez, takes place in the fall. This year, the Regatta is being held from September 25th to October 3rd, when the Société Nautique hosts about 300 sailing yachts in the annual competition. Teams from fifteen different countries will take part in the race and the entire town will be alight with the festivities that go along with this important yearly event. So don’t worry that once the summer is over, the paparazzi have packed away their lenses and N.E.R.D. stops performing at V.I.P., there won’t be anything to do in St. Tropez. If you do decide to book an autumn getaway in St. Tropez, then a luxury villa rental, complete with VillaHotel service, (think five-star hotel then add a star, gorgeous grounds and complete privacy) is really the way to go. Of course, if you ever get tired of hanging around your own private paradise, there will still be lots to do in town, from the less busy beaches to new restaurants like Pierre Gagnaire’s Colette in the new Hotel Sezz. So forget the crowds and the sweltering sun–choose autumn for your stay in St. Tropez. This entry was posted on Friday, August 27th, 2010 at 7:22 pm	and is filed under Saint-Tropez. You can follow any responses to this entry through the RSS 2.0 feed. You can leave a response, or trackback from your own site.